I know, I know. It's been a while since a posted a new recipe. Between running Plate & Pencil, teaching, and putting on Tangra Spring, I've been a little short on time, to put it mildly. Sadly, things like creating new recipes can sometimes go on the back burner. Also, this winter sure was long wasn't it? I think the lack of sunshine, the frigid April that felt like March, and rainy May that felt like April made most of us feel a little less inspired in the kitchen. Sometimes all I wanted was soup, spaghetti, pizza, soup, spaghetti, pizza, rinse, repeat. Anything that could be made or purchased in 10 minutes or less. Luckily, creating new recipes for Tangra Spring, the Indian-Chinese vegetarian dinner series I co-chef with Chitra from ABCD's of Cooking, brought the fun back into cooking again. We had yet another great night cooking for our guests, aided by some fantastic local produce from Good Eggs, like radishes, ramps, and bok choy microgreens. For vegetarians, going to Chinese restaurants is often a dicey endeavor. In China, if you ask for meatless dishes at a restaurant, you'll often hear something along the lines of, "Hmm. Well, we have plenty of chicken dishes. Or duck. Or fish." (In Chinese, the word for "pork" is the same as the word for meat.) Even here in the US, often "vegetarian" dishes in Chinese restaurants would contain pork or chicken stock or fish sauce. The thing is, Chinese food doesn't have to contain tons of meat. There are plenty of dishes that are based on using fresh vegetables and tofu, and many of them can be made entirely meatless. A while back, I started teaching Chinese vegetarian cooking classes at ICE and the Brooklyn Brainery to help vegetarians navigate the tricky landscape of Chinese cuisine. One of the dishes I've taught is making vegetarian mapo tofu, and over the years I've refined it to make it even better. 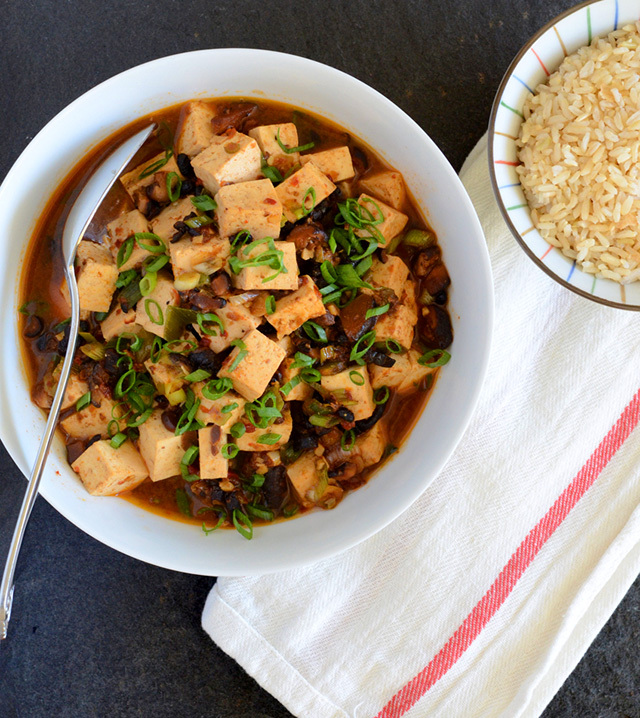 Now, traditionally, Sichuan mapo tofu contains plenty of ground pork for flavoring, but there is a lesser-known vegetarian version called mala tofu. It's often made by just leaving out the pork, which makes the flavor rather flat, in my opinion. What you need to replace the pork is to get creative with shiitake mushrooms.